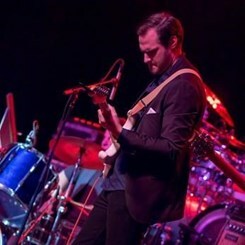 John Udinsky Jr is a guitarist, multi-instrumentalist, arranger and composer from Philadelphia, PA. From a humble beginning as a PMEA All-State Musician and an alumni of the Hatboro-Horsham School District, John went on to earn a B.M. in Jazz Guitar Performance from The University of the Arts. During his time there, he was a member of the school's prestigious 'Z Big Band' ensemble. After graduating in the spring of 2014, Udinsky began to widen his network by freelancing in the Pennsylvania, New Jersey and New York tri-state area professionally, lending his talents to various singer-songwriters and jazz groups. This would eventually lead to his recruitment into the Philadelphia based jam band 'Hambone Relay' in 2015. In 2016 John was featured on their LP entitled 'Free Hugs' and toured the east coast with them up until the end of 2017 when he decided to shift gears and focus on recording and performing under his own name. As of 2018, John is busy writing and arranging music for his first solo fingerstlye guitar album due out sometime this year.